D Apolo, V Báez, L Pauker, G Pasquel (2017): “Corporate Communication Management: Considerations for the approach to its study and practice”. Revista Latina de Comunicación Social, 72, pp. 521 to 539. Valerie Báez [CV] Corte Nacional de Justicia del Ecuador - valerie.baez@cortenacional.gob.ec. Introduction. This article presents an approach to the identification and definition of categories, components and elements that allow us to approach the study and practice of Corporate Communication Management as a strategic tool for achieving institutional objectives. Method. We conducted a literature review in order to identify the distinct contributions of different authors whose work relates to the study of Corporate Communication. Results. Contributions from different disciplines have produced varying conceptions of Corporate Communication, making its definition the product of individual interpretation and preventing objective understanding of its theoretical importance and practical application. Conclusion. In this regard, this article’s purpose is to reflect on the analytical foundations and relationships between the contributions considered here, thus providing a proposed definition that enables Corporate Communication’s application by academics, professionals and students interested in the subject. [EN] Corporate communication; management of intangibles; corporate identity; corporate image; corporate reputation. [EN] 1. Introduction. 2. Methodology of analysis. 3. Approaches to Corporate Communication. 3.1 Categories, components and elements of Corporate Communication Management. 3.1.1 Corporate Identity (CId). 3.1.1.1 Corporate Culture. 3.1.1.2 Corporate Philosophy. 3.1.2 Corporate Image (CIm). 3.1.2.1 Image-fiction. 3.1.2.2 Image-icon. 3.1.2.3 Image-attitude. 3.1.3 Corporate Reputation (CRp). 4. Conclusions. 5. References. After analyzing each of the contributions submitted by different authors to the ​​study of Corporate Communication, and determining the elements, components, definitions or categories employed in their approach, one cannot fail to see the importance of the psychological, sociological and anthropological processes that make up Corporate Communication Management; as Costa comments (2015: 10), "communication is action and action is communication. Facts not only ‘are,’ but they also signify," and therefore entail human interaction. In this sense, Mínguez (2000: 303) presents a route that turns away from a certain "terminological confusion" regarding the identity, image and reputation of Corporate Communication. It is relevant to mention that the term ‘corporate’ will be understood from the approach presented by Costa and his conception of the Latin 'corpus,' whose meaning alludes to the body, understood as a 'totality, integrality, holism, intrinsic unity, organism, system' (Costa, 2006: 51) constituted by processes of interaction, meaning-making and action. How we understand institutions, organizations and companies as systemic bodies that are crossed by different interests, plans, and contexts (ascribed to the conjunction of interest groups in a close, voluntary relationship with shared objectives) defines the relevance of Corporate Communication Management to those processes. Since "the results of communication are not always observed in the short term" (Morales, 2005: 119), and building experiences and relationships takes time, we should not consider communication as a kind of instrument. The discipline should instead be treated as a strategic analytical process that allows users, based on measurement and evaluation, to establish continuous improvement frameworks that guide decision making in the "economic, political, business, social and cultural development" (Gálvez, 2014: 27) of real contexts. Communication is one of the pillars of collaborative work: it is strengthened through the building of bonds, emotions and experiences; as social beings, peoples are shaped in daily life according to their experiences, orientations, and contexts—communication allows the "building and managing [of these] shared realities" (Mannuci, 2008: 45). Communication can be seen as "an integrative methodology" (González, 2014: 10) that generates results within social groups. We should note that ‘action,’ as presented by Costa (2014), can also be understood as ‘reputation,’ following Andreu's contributions (2012: 3), who argues that those elements are linked because there must be a logical correlation between "the facts (what is done) and communication (what is said)." 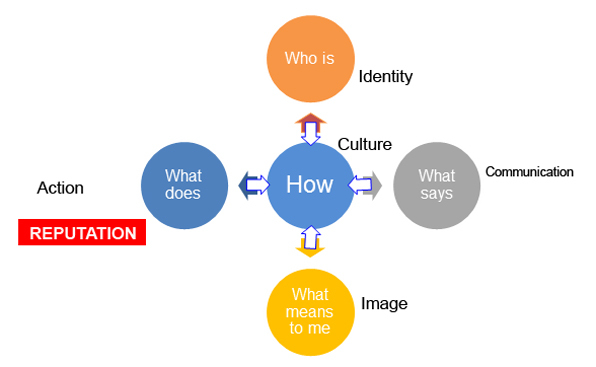 In real contexts, concern for managing intangibles like identity, image and reputation takes form according to the efficiency and efficacy of existing strategies, types and directions of information exchange, and stakeholders. The mental construction of a brand, according to Costa (2013: 11), begins with the representation of its "symbolic capital"—this shapes the way in which it identifies itself and communicates with others, seeking to identify its attributes and use them to exploit a competitive advantage. For this, in the case of Corporate Communication, one seeks to analyze and understand the relationship between image and reputation presented by Costa (2015: 109), where "reputation is selective and private, and it is forced by the image that is public and notorious." Doing so recovers the corporate identity as a type of relationship between the institution and the members that compose it. According to Capriotti (2009), this process consists in taking into account corporate philosophy and culture and how their management contributes to the "commitment of the collaborators, stimulates the generation of ideas and encourages the achievement of objectives" (Ritter, 2012: 51). To this end, the Communications Director (DirCom) "provides the organization with a global vision, holistic in the parts and details, and systemic in its operation as a whole" (Costa, 2012: 39). According to Fuentes, "in our current environment, communication management is of crucial importance" (Fuentes, 2005: 45) for any strategic vision that aims "to perceive flows and to imagine futures and the routes that lead to them" (Pérez, 2012 : 97), especially if it is recognized that those intangibles contribute to favorable responses from stakeholders. In pursuing this investigation, we analyzed and surveyed contributions of various authors (Capriotti, 1999; Van Riel, 1997; Castro, 2007; Rincón, 2014, Túñez and Costa, 2014 and Ulloa And others, 2015) which have become key references in the study of Corporate Communication in Ecuador. By doing so in line with the approach described above, it was possible to determine that, at present, Corporate Communication Management has had contributions from authors specializing in areas such as public relations, administration, marketing, advertising, branding, and design, among others; as mentioned by Pérez and Rodríguez (2014). It is important to start this section by noting that Corporate, Organizational, Institutional, and Strategic Communication are considered different types of research frameworks. Corporate Communication has categories of research and defined planning strategies, while Organizational, Institutional and Strategic Communication bolster it by emphasizing communication between internal and external sources. For example, Aljure (2015) identifies three areas of communication in organizations: institutional communication, internal communication, and marketing or commercial communication. In this proposal, one detects that the focus for developing strategic plans falls on "building, maintaining, and increasing the knowledge, understanding, awareness and image among stakeholders" (Aljure, 2015: 44). Through this analysis of the internal and external states of affairs, a plan of action will contain the following steps: "DOFA analysis, definition of objectives, definition of audience, development of message, definition of plans and tactics, and definition of indicators" (Aljure, 2015: 175). Thus, as the research processes and subsequent planning will be directed to both the internal and external domains, the strategies will likewise revolve around them. If this analysis is applied to perspectives on Institutional Communication, it is not very different. Egidos (2000: 3) refers to the report by McBride and presented at UNESCO (1978) to note that Corporate Communication is understood as "the exchange system for data, information, ideas and knowledge established between public and private, national and international institutions on the one side, and its real and virtual public on the other." Alternatively, Weil (2003) comments that the focus of Institutional Communication is to take the leap away from economic or market interests alone, distinguishing itself from Commercial Communication. In line with Weil, Rodrich (2012: 228) indicates that Institutional Communication "is the management tool that provides a framework for the effective coordination of all internal and external communications"—in this example, emphasis continues to be placed on the strategic management of internal and external communication. "The set of internal and external communication strategies focused on the relationship between actors and the institution, recognizing their contexts, organization, and settings in order to construct joint objectives, and combining all efforts to link with their environment and achieve those goals." This is the method given for the approach and planning to make internal and external communication a contribution of value towards the achievement of objectives. Corporate Communication therefore draws on strategies of internal and external communication, not as a basis for its research and management, but rather to further examine and describe them based on their components. It allows measurement, not by furnishing tools or general objectives, but by providing continuous improvement in planning and the evaluation of the elements. In this way, the main conjunctions, independent of the planning processes and variations among individual authors, is that Organizational, Institutional and Strategic Communication emphasize the management of internal and external communication as sources of representations, discourses and meanings between public audiences and institutions, organizations and companies. Corporate Communication, on the other hand, uses those methods to define categories of analysis that allow subsequent planning based on strategies, activities and actions focused on relations with stakeholders. These categories include identity, corporate image and reputation. "Corporate Communication is a management tool by which all forms of internal and external communication are consciously used, and are harmonized as effectively and efficiently as possible in order to create a favorable basis for relations with the public on which the company depends". "Is established as a systematic process by which people are integrated and coordinated, an organizational structure with the aim of developing an organizational stamp out of the components of conceptual identity, both visual and behavioral." "Is divided in two: Internal and External Communication. The first works in the conception and development of corporate culture, that is, the ideas and qualitative concepts that define the organization. The second is responsible for managing the image that the company wants to offer to the market or society. In both cases cooperation is key to achieving profitability objectives." The approaches presented by Van Riel (1997) and Castro (2007) link internal and external communication as components of corporate communication, but it is worth mentioning that these approaches deviate from this article’s conception of Corporate Communication, which we consider a general process focused on managing identity, culture, image and reputation rather than a specific tool. In this regard we follow the work of Costa (1995) and Capriotti (1999), who focus this process on the categories that will later be applied to institutional goals with the support of internal and external communication tools. "Concerned with the exchange of experiences, knowledge, emotions and thoughts between subjects that integrate with the aim of producing senses, creating symbolic universes and systems of internal and external significance that contribute to the achievement of strategic objectives" (Ulloa et al, 2015: 292). 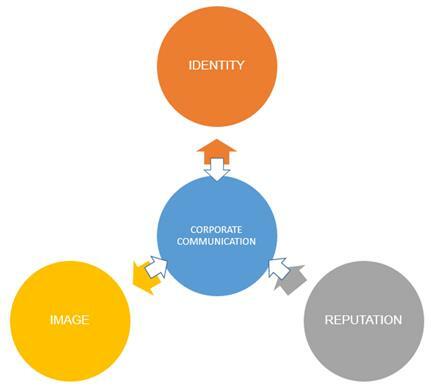 Corporate Communication is the management of identity, image and reputation through research that allows identification of shared values, attributes, differentiators, and competitive advantages; it comprises the strategic management of communication tools that contribute to public awareness and the construction of links with stakeholders, thereby contributing to the achievement of stated objectives. For this approach, the understanding of ‘management’ derives from an idea presented by Fundación Chile (2012), which states that each process should focus on planning, organization, direction and control. In this sense, each category of Corporate Communication, from the beginning of the research and execution process, must take these steps into account in order to achieve the objectives previously proposed. After the revisions made and the proposal submitted to a definition of Corporate Communications, we must take into account various ways of understanding its analytic categories. Doing so allows us to effectively manage them. To address each of these categories we must understand the elements that comprise them. Together, they allow us to gather relevant data for measurement and decision-making that will eventually define research design and our subsequent proposal for the Corporate Communication management plan. Corporate identity is constituted as much in the daily life of the institution as intheir stakeholders. It presents an approach that goes beyond the meaning of ‘corporate identity’ derived from graphic design. It is more broadly understood as "the set of traits and attributes that define [an institution’s] essence, some of which are visible and others not" (Villafañe, 2008: 26). That is to say, every organization, institution and company, constitutes itself as a social system through its representations of itself and the characteristics of its constituent interest groups. For Scheinsohn (2009: 46), CId is "the capacity for recognition possessed by a brand, associated with a particular promise (...), and the totality of the ways in which a company has decided to be evaluated by its audiences." Linking Villafañe (2008) and Scheinsohn (2009), this depends not only on the institution’s organizing structure, but how it seeks to be recognized by its stakeholders. It includes the "history of the organization, its beliefs and philosophy, the type of technology it uses, its owners, its people, the personality of its leaders, its ethical and cultural values ​​and its strategies" (Ind 1992: 3). But above all, it seeks to clearly, coherently and concisely express "the overall strategy of the company ... all its manifestations, productions, properties and actions" (Costa, 2006: 221), allowing it to focus not only on producing messages, but also on its relationship with its stakeholders and their interests. "The first of these is the "soul" (...) and represents "what the organization really is, at this moment." (...) The second one, on the other hand, is "mind," (...) and represents "what the organization wants to be". According to Capriotti (1999: 24), corporate culture is "the set of beliefs, values ​​and behavior patterns, shared and unwritten, by which the members of an organization are governed, and that are reflected in their behaviors." 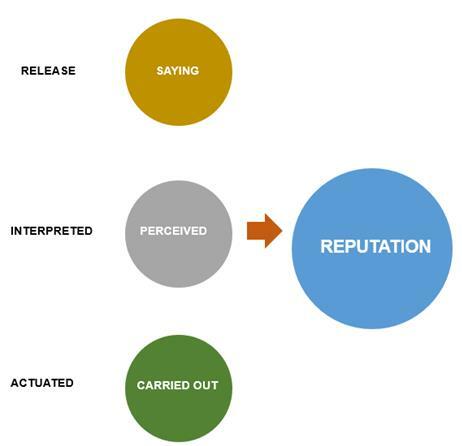 This is how each stakeholder assigns a meaning to the institution according to his or her experience, and gives makes it relevant to his or her own daily life. “The set of basic assumptions shared by members of the organization regarding its different aspects and issues. They are invisible structures, unconscious and assumed as pre-established”. “The set of principles shared by the members of the organization in their daily relationship within it. They have a higher degree of visibility than beliefs, but are not clear or obvious”. “Models of behavior observable in a wide group of members of the organization. They are visible and manifest aspects of corporate culture, which express its beliefs and values”. "The overall conception of the organization established by senior management (owner, CEO, Board of Directors, etc.) in order to achieve its goals and objectives. It is what top management believes to be central, lasting and distinctive about the organization." By establishing the direct relationship between this and corporate culture, key points are identified that contribute to creating favorable feelings and emotions in the stakeholders, so that the institution’s mission, vision, and values ​​are linked in its real character. These categories that identify the elements of corporate identity are important because, when outlining the research methodology and subsequent planning, their components provide points of reference for the design of instruments and methods of analysis. Not only must the elements presented be used to frame the application of the different research tools, but they must be clearly identified to the main stakeholders. By taking those stakeholders’ relationship with each category’s statement of culture and philosophy into account, it will be possible to plan strategies, activities, and actions to manage corporate identity in a manner that coordinates the significance that the organization, institution or company and the stakeholders give to such statements. After identifying these relationships, Corporate Communication may reflect on how to strengthen their key attributes and thus use enhanced communication to achieve institutional objectives. "The definition of the business or activity of the organization. “The perspective of the organization’s future, its ultimate goal. It indicates ‘where it wants to arrive’, or the ‘ambition’ of the organization, its particular challenge”. The CIm is the mental significance that a particular stakeholder gives to it. That is, the attitude that one takes in relation to the organization, institution and company will depend on the feelings and emotions produced by how they are perceived. It is not necessary that such an image be real or not, nor that it generate the same perception in all interest groups. Accordingly, it is important to investigate and characterize such perceptions in order to "manage the communicational resources in an efficient and effective way" (Pasquel et al., 2014: 2). For any organization, institution, or company, "dialogue [with the public] is impossible without prior knowledge of how [the organization, institution, or company] manifests [in a stakeholder’s mind]". (Ulloa, 2007: 111). 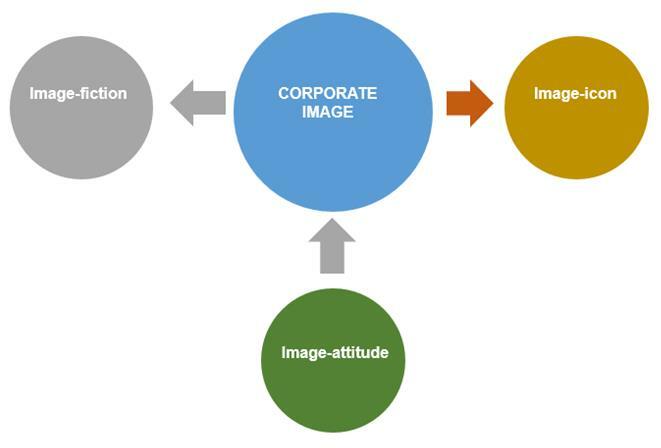 Capriotti (2013: 16) approaches the corporate image according to "three major conceptions or prevailing notions: a) Image-Fiction, b) Image-Icon, and c) Image-Attitude". The postulates that follow will be ascribed to these conceptions and will be identified as components of the corporate image. The ‘image-fiction’ will be understood as the positive or negative valuation that stakeholders give to the organization. It is important to mention that these behaviors are guided by imaginary and social representations, which provide frames of reference linked to actors’ multidirectional interactions with an organization that produce their mental relation to it. According to revisions by Capriotti (2013: 16), the image can be understood as "the ‘appearance of an object or fact,’ as a fictitious event that is nothing more than a manipulated reflection of reality." This category of analysis is thus crucial for Corporate Communication management because the strength of correlation between the perceived and the lived can generate dissonance and lead to problems for the construction of corporate reputation. 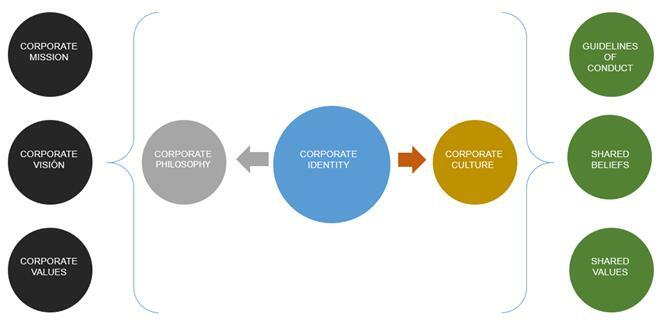 Within this proposal, the ‘image-icon’ will be understood as the visual representation of the corporate image. It can comprise "the symbol, or iconic figure that represents the company; the logo and corporate typography; the name of the organization written with a particular typography and in a special way; and corporate colors or chromatic range "(Capriotti, 2013: 19) One must identify "the relations between the elements and structures of representation" (Villafañe and Mínguez, 2002: 33) in these expressions, generally by investigating the correspondence between what is communicated visually and how stakeholders perceive those products. Capriotti (2013: 22) also argues that we can consider the ‘image-attitude’ as the level of awareness that the stakeholders have about the institution in reference to others of the same type, identifying "basic characteristics, with which we elaborate a stereotype of it. This evaluation implies an assessment, a position with regard to the institution and, consequently, a way of acting in relation to it." These attitudes would be shaped "by a set of attributes relating to the company; each of these attributes may vary, and may or may not coincide with that individual’s ideal combination of attributes" (Sánchez and Pintado, 2013: 18). "When a person can identify a company and the theme or sector in which it is located in response to specific, guiding questions”. "When a respondent can identify an organization, and the theme or sector in which it is located, in response to general, unspecific questions”. "When an individual recognizes the company, its products or work area, and also spontaneously cites it among the first 4 or 5 that come to mind. Being in this select group is important because this group is usually that considered by the person when making spontaneous choices". "When the company is the first cited in response to a question, and occupies the foremost position in the person’s mind”. It is therefore important to know how these attributes relate to competitors’, which permits an institution to identify their own distinct reputation in order to develop strategies, activities and actions for managing the corporate image. Those strategies contribute through communication to the company’s public profile, understood as the “degree of knowledge about an organization among the public” (Capriotti, 2013: 181). "When people do not even recognize the name of the company. This is the most negative position on the scale of public awareness. For example, if a person has never heard the company’s name before". "When the people recognize the name, but are unable to properly identify the organization’s industry or theme. For example, if a person does not know what kind of company it is”. "The awareness that a company’s stakeholders have regarding its corporate behavior, especially regarding its degree of compliance to its commitments toward its customers, employees, shareholders, and the community in general" (Villafañe, 2004: 193). That is, it is based on identity and corporate image, which are understood as mental constructions and commitments. One aspect that stands out, however, is the importance of a relationship with stakeholders based on the experience "that is the result of an effective relationship" (Caldevilla, 2010: 145). The final product of these interactions are result of "two vectors: the facts (what is done) and communication (what is said). Not only facts, not just communication: both together "(Andreu, 2012: 3). Above all, Corporate Communication seeks to ensure that the "sum of the perceptions that different audiences have and set a person or an institution over time" (Ritter, 2013: 135) are favorable. And it aims to ensure that those perceptions are not only impromptu ideas without substance, but instead identify attributes that Corporate Communication managers highlight in order to influence the decision-making of stakeholders. In each listed component, it is important to focus on measurable elements, which will be analyzed according to the calculations provided by Leon and Cifuentes (2009) and Orozco y Ferré (2012). The importance of this illustration is to establish, based on evidence, avenues of inquiry for future research, and also to determine the elements and understand the role that each play from the components of CRp. This article provides analysis that contributes to dialogues presented by Túñez and Costa (2014) about key considerations and scenarios for Corporate Communication. Understanding the categories, components and elements that comprise it provides a more specific perspective for its use. The literature review shows the importance of this definition by noting the polysemy that the term ‘Corporate Communication’ has developed (Capriotti, 1999; Costa, 2003 and Castro, 2007 and Ulloa and others, 2015), and has provided different ways of approaching it. Throughout this article, we presented varying viewpoints that contribute to a single definition that can contribute to the work of academics, professionals and students that seek to study and implement Corporate Communication management. It is ultimately of great importance to understand the difference between Corporate Communication’s distinct elements, for they allow professionals to develop communication strategies aligned to organizations’ internal needs, be they to create, improve or maintain corporate identity, image and reputation. To ensure that these components are well-designed, it is critical to align and direct the management of Corporate Communication with stakeholders, since success or failure of the company depends on the establishment of a dialogue that likewise allows the satisfaction of their demands and expectations. Finally, this study shows that Corporate Communication has become a transversal axis that has rarely been recognized as the cornerstone that supports and contributes to the achievement of institutions’ goals. A Andreu. (2012): “Por qué las empresas sí deben preocuparse de gestionar su reputación”, in Telefonica, Barcelona, June: https://www.telefonica.com/es/web/sostenibilidad/articulo/-/blogs/por-que-las-empresas-si-deben-preocuparse-de-gestionar-su-reputacion-o-por-que-schumpeter-tiene-una-limitada-vision-de-la-reputacion-de-las-compa-. Accessed 11-01 of 2016. D Apolo, H Murillo & G García (2014): Comunicación 360: herramientas para la gestión de comunicación interna e identidad. Quito: Facultad de Comunicación Universidad Tecnológica Equinocial. P Capriotti (2009): Branding corporativo. Santiago de Chile: Colección Libros de la Empresa; EBS Consulting Group. P Capriotti (2013): Planificación estratégica de la imagen corporativa. Málaga: IIRP-Instituto de Investigación en Relaciones Públicas. B Castro (2007): El auge de la comunicación corporativa. Sevilla: Castillo. J Costa (1977): La imagen de empresa. Madrid: Ibérico de Ediciones. J Costa (1995): Comunicación corporativa y revolución de los servicios. Madrid: Ediciones Ciencias Sociales. J Costa (2006): Imagen Corporativa en el siglo XXI. Buenos Aires: La Crujía. J Costa (2012): El DirCom hoy: Dirección y Gestión de la Comunicación en la nueva economía. Barcelona: Costa Punto Com. J Costa (2015): El paradigma DirCom. Barcelona: Costa Punto Com. 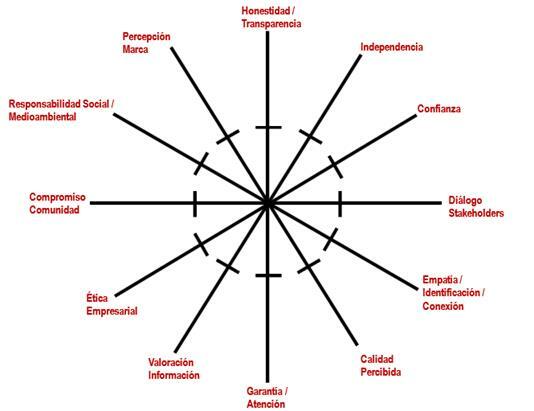 S Fuentes (2005): El mapa integral de comunicación. En Costa y otros (2005). Master DirCom: los profesores tienen la palabra. La Paz: Grupo Editorial Desing. Fundación Chile. (2012): “9 pasos para planificar su gestión”, en Desarrollo de Proveedores, Santiago de Chile, september: http://desarrolloproveedores.cl/2012/09/9-pasos-para-planificar-su-gestion/ Recuperado el 20 de 01 de 2016. N Gálvez (2014): “Comunicación estratégica: el plus en la gestión empresarial” en Estrategas: investigación en Comunicación, 1. Ecuador: Universidad de Las Américas, pages 19-28; recovered January 20, 2016. E González (2014): “¿Es rentable medir la comunicación en la empresa?” en Estrategas: investigación en Comunicación, 1. Ecuador: Universidad de Las Américas, pages 7-17; recovered January 20, 2016. N Ind (1992): La imagen corporativa: estrategias para desarrollar programas de identidad eficaces. Madrid: Ediciones Díaz De Santos. 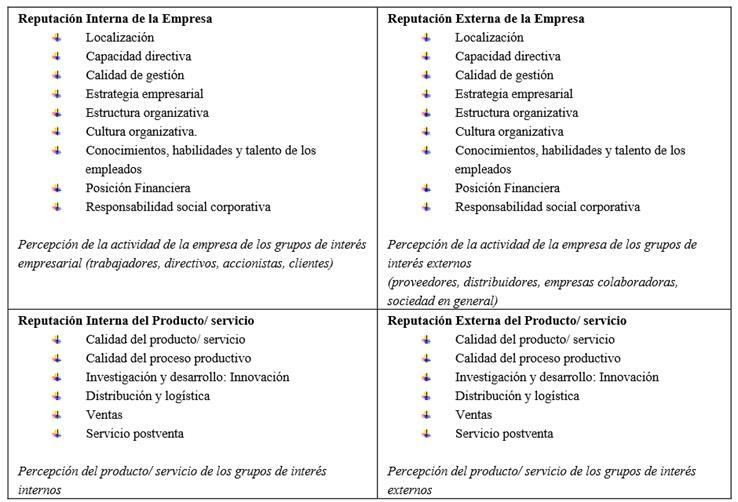 P Kotler y K Keller (2006): Dirección de marketing. México: Pearson Education. M Manucci (2008): Impacto corporativo. Buenos Aires: La Crujía. O Morales (2005): El verdadero valor de la comunicación. En Costa y otros (2005). Master DirCom: los profesores tienen la palabra. La Paz. Grupo Editorial Desing. J Orozco y C Ferré (2012): Los índices de reputación corporativa y su aplicación en las empresas de comunicación. Tarragona: II Congreso Asociación Española de Investigación de la Comunicación. R Pérez (2012): Pensar la estrategia. Buenos Aires: La Crujía. M Ritter (2012): Cultura organizacional. Buenos Aires: La crujía. M Ritter (2013): El valor del capital reputacional: por qué la opinión que el público tiene de su empresa es un activo estratégico. Buenos Aires: Ritter & Partners. J Sánchez y T Pintado (2013): Imagen Corporativa: Influencia en la gestión empresarial. Madrid: ESIC Editorial. D Scheinsohn (2009): Comunicación Estratégica: La opinión pública y el proceso comunicacional. Buenos Aires: Granica. M Túñez y C Costa (2014): Comunicación corporativa: claves y escenarios. Barcelona: UOC. C Ulloa (2007): Comunicación, cultura y desarrollo. Quito: Quipus. C Van Riel 1997: Comunicación corporativa. Madrid: Editorial Prentice Hall. J Villafañe, y N Mínguez (2002): Principios de teoría general de la imagen. Madrid: Ediciones Pirámide. J Villafañe (2008): Imagen positiva. Gestión estratégica de la imagen de las empresas. Madrid: Pirámide. P Weil (1992): La comunicación global: comunicación institucional y de gestión. Barcelona: Paidós. Article received on 20 on December 2016. Accepted on 8 May.